Rose Lace Cushion Grip Crochet 10 Hook Set with Case, Needles and Scissors. Cushion Grip Crochet 10 Hook Set with Case, Needles and Scissors. Rose Cushion Grip Crochet 3 Hook Set with Case, Needles and Ruler. Set of 5 cushion grip hooks - 0.90mm - 1.75mm, comes in Pink Dot case. Cushion Grip Crochet 8 Hook Set with Case, Needles and Gold Scissors. Cushion Grip Crochet 8 Hook Set with Case, Needles and Silver Scissors. 18pc Crochet Hook Set in case with needles, scissors and ruler. 15pc Crochet Hook Set in case with needles, scissors and ruler. 13pc Crochet Hook Set in case with needles, scissors and ruler. 7pc Crochet Hook Set in case with needles and ruler. Set of 5 double ended hooks in case with Scissors, needles and stitch markers. 2mm, 2.5mm, 3mm, 3.5mm, 4mm, 4.5mm, 5mm hooks in heart print case. 8 Rose Gold Crochet Hooks 3mm to 6.5mm. 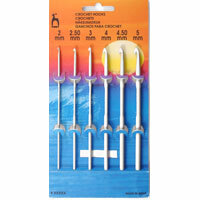 Set of 6 Alumimium crochet hooks 2mm to 5mm. Set of 22 Crochet Hooks - 12 anodized aluminium and 10 steel hooks, Including purple case. 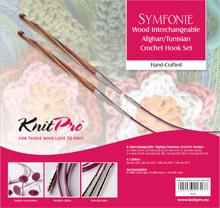 Interchangeable Crochet Hook set - 8 hooks, 4 cables and pouch. 5 Single Ended Crochet Hooks - Sixes 3.5, 4.5, 5.0, 6.0, 8.0mm. 15 Hooks at a special price. Ergonomically designed handle and aluminium head. Set of 9 Hooks. Ergonomically designed handle and aluminium head. Ergonomically designed handle, gold tipped steel hook set of 6. 3 coloured crochet hooks, sizes: 4mm, 5mm, 6mm. Set of 9 Colourful easy grip handled hooks, 14cm. 2mm to 6mm. 8 addi click hooks, 1 cable and 1 heart stopper. Slick Hook Set with changeable handle. SET of 9 Comfortable easy grip handled crochet hooks, made of Elastomer and Aluminium. Comfortable easy grip handled crochet hook, made of Elastomer and Steel. 6 hooks, 4 cords, 2 end buttons and 1 extender and case. Filled Crochet Hook Case with 14 Bamboo Hooks. 2.0mm - 10mm. 5 x Maple wood double ended crochet hooks, 15cm. Set of 10 Crochet Hooks Acrylic - 5.00mm, 5.50mm, 6.00mm, 6.50mm, 7.00mm, 8.00mm, 9.00mm, 10.00mm, 12.00mm and 15.00mm. 6 Hooks sizes 2.5mm, 3.0mm, 3.5mm, 4.0mm, 4.5mm and 5.0mm. 8 Hooks sizes 1.5mm, 1.75mm, 2.0mm, 2.5mm, 3.0mm, 3.5mm, 4.0mm and 4.5mm. Comfortable easy grip handled crochet hooks, made of Elastomer and Plastic. 11 pairs bamboo knitting needles, case, cables, needles, stoppers and gauge with yarn cutter. 10 bamboo hooks, case, cables, needles, gauge with yarn cutter. set of 9 colourful easy grip hooks 2mm to 6mm. Crochet Hook Set - 3mm, 3.5mm and 4mm.